Chocolate Mint is one of the most beloved flavors. With a combination of rich dark chocolate and a light, refreshing mint flavor�this Chocolate Mint flavored coffee is a delicious and sumptuous treat! Perfect day or night, this 100% Arabica bean coffee will make your taste buds feel like they are bathing in luxury. And with only 2 calories, you can�t go wrong with this incredible Chocolate-Mint creation. Packaged in a heat-sealed valve bag, the Chocolate Mint flavored coffee is fresh roasted and shipped on the same day. 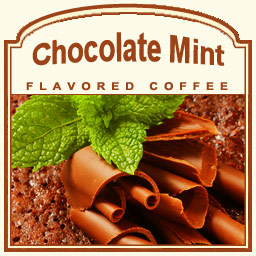 Indulge in this Chocolate Mint flavored coffee hot or cold � however you like it!